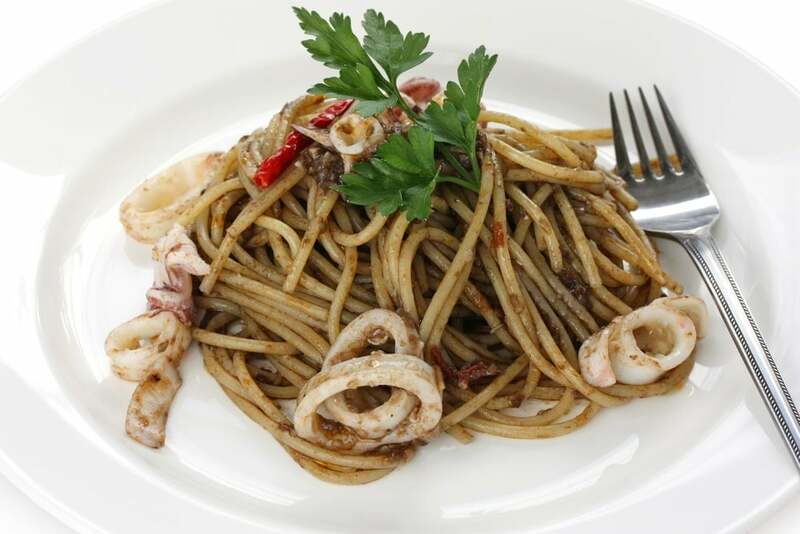 The origin of this pasta with squid ink recipe is controversial. Both people of Messina and of Catania claim they have invented it. To add to the competition, it is also a common recipe in Syracuse. What’s certain is that it was born in the East of Sicily and is absolutely delicious. Andrea Camilleri’s Inspector Montalbano can’t stop thinking about this legendary dish when being invited for dinner by the police Superintendent, making every effort to not confront his superior with his tricky case so that the dinner invitation is safe. Clean the squids well and cut the body into very fine strips. Leave the tentacles out. Chop the garlic clove finely and peel the tomatoes. Fry the chopped garlic with some oil on medium heat. Add peeled tomatoes without the seeds. When the tomatoes are ‘withered’, carefully add the squid ink to the pan. Add the squid, stir well and blend with the wine. Dilute the sauce with a glass of water, lower the heat and simmer for about half an hour. We’d really love to hear your opinion! Please, comment below if you’ve tried the recipe, have some tips and tricks to share or would like to ask our cooking experts some questions. Do you want to try more exciting recipes in authentic surroundings? Check out our Italian cooking holidays or get your holiday brochure today.